YachtLegend Route for the Ionian Islands in Greece. Crystal blue water, beautiful gentle breeze, swimming fit for royalty, night-life like an upper-echelon of ancient Greek culture, homemade wine around every corner, freshly caught fish perfectly grilled. Not really anything bad to say about this area. Gouvia Marina is a short hop from the Corfu (CFU) airport. Located about 20 minutes north of the airport, transfer is available by taxi and bus; directions are found on a local website. Arrive at the marina around 2PM to prepare for the week of your lives! As always, it is recommended to arrive a day or two early to get acquainted with the local scene and to get settled into vacation mode. We aim to help relieve those stresses you've come from, but it is always nice to start your vaca from a relaxed place. Take a few minutes to appreciate the view just before your plane is landing. You'll be out there on those blue waters shortly! Welcome to the Ionian Islands! We board in Gouvia, just north of the town of Corfu. As usual, dinner out on the town followed by our first night on the yachts getting to know your yacht- and flotilla-mates. We spend the night after our first sail in a natural bay and build a great raft! Welcome in the week with the best music and amazing new friends true YL style. Home to just 20 people year-round, Antipaxos is a tiny beauty of an island. 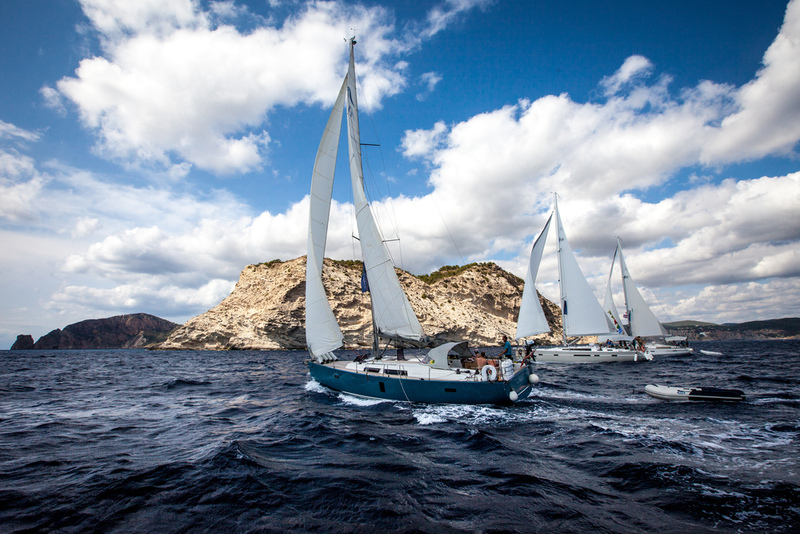 Three amazing beaches, the best of which will make home to a YachtLegend fleet tonight are available for our pleasure! Antipaxos is known for its vineyards and wine...just sayin'. Time for some culture! The small town of Gaios welcomes us with Venetian-style architecture, pastel colored buildings, and not slightest inkling of an idea of how we do our thing. We'll gladly initiate. Explore the village and island today! Extra points if you find the windmill. How is it this blue? Lakka has some of the most amazing blue water in the Ionians. It's a short sail from Gaios, so we'll leisurely make our way there. Drop some Legend on it. Raft up YL style once more. Annual midnight swim anyone? With luck, we will cement our status as true Legends in the sole company of the Greek gods of ancient. Zeus himself shall be graced by our presence in his home. Poseidon will nod to our epic lives on his sea; Aphrodite will gaze on in envy of our exploits. As we bid farewell to our hosts, we shall raise a glass in honor of the legends who have shared the sea before us and to those who shall become legends in the time to come. No rush this morning as we know the Greek gods will not want to abandon our loving embrace. Console them dearly and remind them that we'll return once again to frolic in their backyard. Upon return to Gouvia, we'll have our last dinner in town, spend our last night on the yachts, then retire to our next adventure.